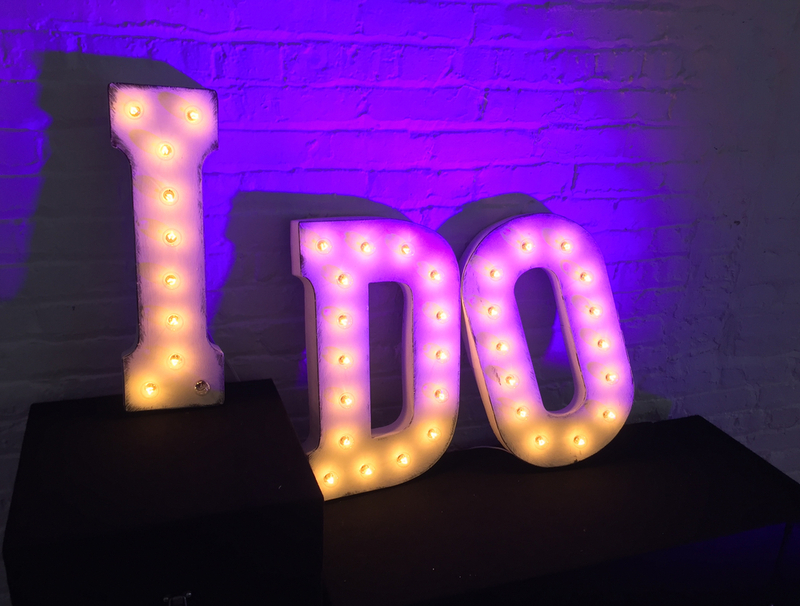 Uplighting looks great with any decorative piece you add to your event style including the Marquee Letters. A total of 24 Par 64 RGBA lights were used to give this wedding reception a nice purple hue. The RGBA lights are nice if you want to use purple because its available as a quick pre-set. In this photo specifically, just 1 of those RGBA lights is tilted slightly toward the Marquee letters which are actually setup on top of the DJs road cases. The DJ had some pretty tall cases he used to transport equipment into the venue. He also had an extra black table cloth with him. We covered the cases with the table cloth, placed the marquee letters on top, and then just plugged everything in.